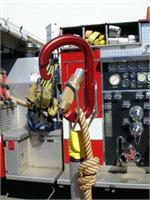 Superclip Rescue is an excellent tool for use in Confined Space Rescue and Tower Rescue. Superclip Rescue is presently being used worldwide by Fire and Rescue Personnel, Military, Electric/power companies, industrial use and Animal Rescue services. stainless spring steel, the Superclip Rescue is built to last. The innovative design holds virtually any rescue carabiner in the open position for attachment to an anchor, rope or harness ring. 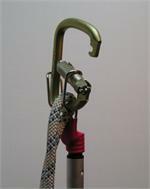 To use, simply attach it to any standard extension pole then push a carabiner into the Superclip Rescue. It will now hold your carabiner open so you can reach out with the pole to attach to an anchor or victim. Patented. Superclip Rescue is designed to hold any standard size 2 stage or 3 stage autolocking carabiner.